A Guide’s Journey: Never Stop Learning and Find New Challenges! First off if you have an addictive personality stop reading now, because heli skiing maybe legal, but I promise it is harder to quit than hard drugs and will probably put you into as much debt. The biggest difference though is that powder skiing will always be worth it. Of course, I say that while I twitch and shake looking at brown ground outside my window here in the Northeast, dreaming of running away back to Alaska. I have, for the last ten years, been chasing down every offering the AMGA puts out there to pursue my dream of becoming an IFMGA Mountain Guide. In past posts I mentioned that it has not always been the easy path and I have learned a ton along the way. Even though I own a climbing gym and mountaineering school, and this comes as a surprise to many, I am a skier with a climbing problem. Don’t get me wrong, I love climbing, but there is almost nothing in this world I would rather be doing than skiing. Some of my best memories are from sliding on snow. From my early days at Maple Valley and Mount Tom (now both defunct), I remember chasing friends, jumping off cliffs and building kickers. USSA racing programs shaped the adult I am today, while college backcountry adventures cemented my love for sliding on snow. The truth is, as a college student chasing a degree in Outdoor Education, when asked what I wanted to be, I always said heli guide. Back then I was way poor and could only dream of heli skiing. I finally got to realize that dream when a bunch of friends chipped together and gave my wife and I a day of heli skiing in Portillo, Chile on our honeymoon. Which is awesome, we needed a blender or more towels like another hole in the head, but heli skiing, that we could use! By that point I had completed the AMGA Ski Guide Course, my Level I, II and III AIARE Avalanche Education courses, and that is when Alaska beckoned. Once again too poor to do a full heli week, 3 friends and I rented an RV and chased the best snow we could find in Turnagain Pass, Hatcher Pass and Thompson Pass on the ultimate ski mountaineering adventure. After nearly a week of being buzzed by helicopters we finally broke down and visited Alaska Rendezvous for a one bump to ski a few lines deeper in the zone. They were the best runs of the trip, and at the end I approached the late owner Theo Meiners, and asked how to apply and he simple stated, “You don’t, around here we use guide applications as toilet paper!” He was joking of course, kind of, but truth be told breaking into the heli skiing world takes a tremendous about of luck, timing and is often about connections. Unlike the Canadian or European models where certification is king, the heli world has, and probably always will be, about mentorship and coming up through the operation. People become guides by putting their time in as a fueler, a cook, desk jobs in guest services, and eventually apprentice guiding, tail guiding and ultimately becoming a full blown guide. These people have intimate knowledge of every piece of the operational puzzle. They learn the operator’s terrain throughout their tenure filling vacant seats whenever possible. They get to work side by side with guides who have literally written the book on heli guiding and over time that knowledge is passed down and for the very lucky they get to take that "front seat." I have nothing but respect for all the guides and operations that I got to mix in with- they are the top of their field and many of them earned their place as some of the finest guides I’ve had the opportunity to work with. I was on a well-defined path towards the IFMGA, but as a student I always look for opportunities to better myself as a guide. After completing my AMGA Ski and Rock Guide Certifications, and getting beat up a little on my Alpine exam, I decided I needed a palate cleanser and to chase a dream. After some quick internet research and an email to Kevin Quinn, president of Heli Ski US Association and Owner of Points North Heli, I decided it was time to explore this niche of the guiding world. The AMGA has been great, and over the course of my certification we did get to use helicopters and snow cats; however, we were treated far more like clients when working around the machines and I wanted that coveted front seat. The AMGA is still the top echelon of guide training and they are phenomenal about teaching the nuances of up and downhill guiding, avalanche forecasting and hazard evaluation, client care and guide security, but at least in my training, they are not teaching directly to the mechanized guiding world. Gear I could not live without: Alyeska GTX Pro Jacket, Alyeska Realization harness pants and my RAS and PAS Airbag Systems, they were literally made for heli skiing! “In the early 1980’s a group of US Heli Ski operators started meeting annually on a very informal basis. The purpose of these meetings was to exchange various ideas, thoughts and information that would help each operator. At this time there were no standards for operation. It was through these meetings that the Heli-Ski US Association was eventually formalized as a 501C corporation and thus began a more formal approach to the development of standards and protocols for helicopter skiing activities within the US. Many of the standards were already in place from the reputable Canadian operators and now HSUS is also an affiliate member of HeliCat Canada sharing many of the very same standards." 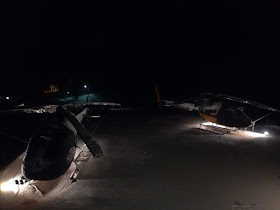 Wasatch Powderbird Guides home base pre-dawn "time to make the forecast"
In addition to these meetings they created Heli Ski US Guide School. This, I believe, was only its second year offering the school, but it caters directly to those interested in gaining knowledge of the mechanized world. I would not say they are competing with the AMGA but supplementing a needed niche. Currently the application standards are very attainable, and while I may have had the most experience on paper, the other participants outnumbered me on heli days almost 10:1. They all had been heli skiing for years and their confidence in and around the helicopter showed; where I admit I was far more confident once the heli left us at the top and all we had to do was ski some the coolest deepest runs of my life. The Guide School is broken down into two one-week sessions. This year the first session was held in Utah at Wasatch Powderbird Guides to get us working in a continental snowpack, and the second session was held at Points North Heli in Cordova, Alaska to poke around in a more maritime snowpack. 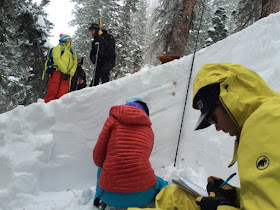 In reality the snow pack differences played second fiddle to the real reason: to introduce us to these two amazing yet different operations and get tied into the community of idols and mentors in each region. Land, Assess, Open and Slay "Ridiculous"
Wasatch Powderbird Guides is based right in the middle of Little Cottonwood Canyon and mostly caters to day guests and private charters. This was my first introduction to just how welcoming these operations would be. 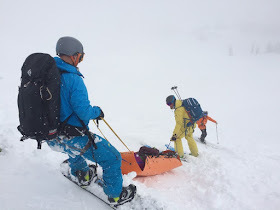 They lifted the skirt of every aspect of their operation, welcoming us to be a part of everything from guide meetings, avalanche forecasting, rescue training and treated us like staff. This full immersion is great, but the greatest strength of the Heli Ski US program is the industry giants they bring in. Lel Tone, over the two weeks, was in charge of herding us like stray cats and just happens to be ski patrol extraordinaire, reality TV star (she’ll kill me for mentioning that) but most importantly heli skiing royalty. 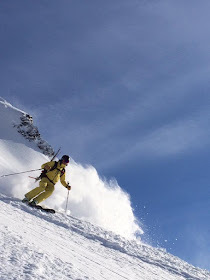 Joe Royer from Ruby Mountain Heli, who has run the country’s oldest heli ski operation in the United States, was our second instructor and general inspiration. Then there are all the other folks brought in from Mike Royer, Joe’s son and right hand man, IFMGA Guide Jonathan Spitzer, Dr. Wes Wylie, WPG Head guide Spencer Wheatley, and I might have fanned out a little getting to meet Ian McCammon. Not to mention all the great owners, pilots and staff at WPG. 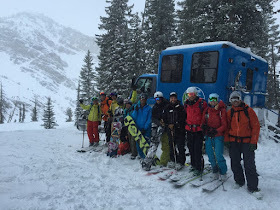 We even had the opportunity to work with Snowbird Cat Skiing and Ski Patrol. As with all mechanized guiding the most challenging part was to stay as flexible as possible and take advantage of any weather windows, all while keeping up with our ambitious training schedule. Utah was great, and the week passed all too fast. I returned home to the leanest winter on record back in Vermont, but the ice climbing was good, and I did sneak in a pair of Mammut "Test & Feel" AIARE Level I courses, but I was focused on returning to Alaska. Alaska has been the site of some my skiing career’s highest highs and lowest lows. After a sprinkling of incidents over 5+ seasons I decided that Alaska was screaming at me to give it a break and I hadn’t been back since 2010. I wasn’t really avoiding AK- mainly I had been chasing other adventures on mountains throughout the world but I was mildly hesitant. This second leg took me to the extremely remote Cordova, Alaska, a small fishing village with no access other than by boat or plane, but just happens to be the home base of Points North Heli and the Orca Lodge. Unlike WPG, there are only week-long guests and everyone including pilots, guides, nannies, cooks, and every puzzle piece of the operation live together family-style. "Family" is the best way I can describe the whole PNH vibe. They have built a community and operation unlike any I have seen. Kevin and Jess Quinn are of course the backbone of this; it was great to see them involved in every aspect. Joe Royer unfortunately couldn’t join us for part two, but Kevin jumped in and opened up his whole operation to us. Much like our experience at WPG we were included in everything. Not only did I get to work and ski with Kevin, but he allowed us to mix with his guides and clients as peers. I got the elusive "front seat" time I was so craving. Kevin, Lel, the pilots, and all the guides gave all of us a ton of leash while learning and making appropriate mistakes and gave lots of opportunities to be out in front making decisions. It was exactly what I was looking for. Keith Davies on the commute home getting that "front seat time." So what is the biggest difference between mechanized guiding and ski mountaineering? It is simply the pace. I feel fairly confident moving clients and myself throughout mountainous zones, sure we all have surprises and things don’t always go as planned but the mountains are where I feel most confident. The AMGA also trains us to operate as “Lone Wolves” and my mentors and idols have me striving to be what many consider the top spot in American guiding, which is being an independent guide. Yes many of us work in operations, but even there you are often on your own once in the field. With the heli, however, you are accessing terrain faster; have to manage sharing the ship with other groups, all while juggling client’s needs, avalanche terrain, fuel cycles and other guides in the zone. Sure, onsight downhill guiding is difficult, but it is more about the team and nuances of the helicopter that I learned the most. I would not say I am afraid of the helicopter, but I have a very VERY healthy respect for it. At roughly $33+ a minute when spinning, I want to be efficient and my biggest personal take home is to actually slow down. Slow is smooth and smooth is fast. This art of course can only be mastered through repetition and the guide program was a nice introduction. There is easy stuff like picking and preparing LZs and PZs, and how to load a basket. My personal crux was having so little time in the zones, I was overwhelmed by how much terrain we had at our disposal. When we did get crowded in a zone, I also felt the pressure to step up to bigger terrain, and while this led to a highlight run of the week in AK, I wouldn’t say I was completely confident standing on top. These reasons are why mentorship in all guiding pursuits is important and why so many guides in the mechanized world are developed in-house, over seasons. 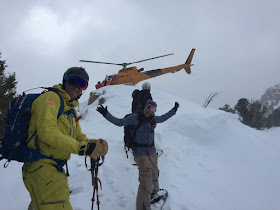 Heli Ski Us Guide School was a great opportunity for me to be introduced to mechanized guiding, and I hope I have the opportunity to continue growing those skills and working with the operations with connections I made. I hope I can be as valuable an asset to these operations as they have been to me. So, if you want to chase a dream with me, in Alaska, Nevada, Utah, Greenland or across the world, contact me and maybe I can put a program together for you to join me next time while I continue to chase this goal! Lel, Joe and Kevin thank you so much for the opportunity, I can’t wait for the occasion to work with you all again. Alexa, Matt, Keith, Jake I’d ski anywhere with you all, let’s plan another adventure soon. Thanks Petra Cliffs Family, Mammut, DPS, Avatech and Julbo for helping me along the way.